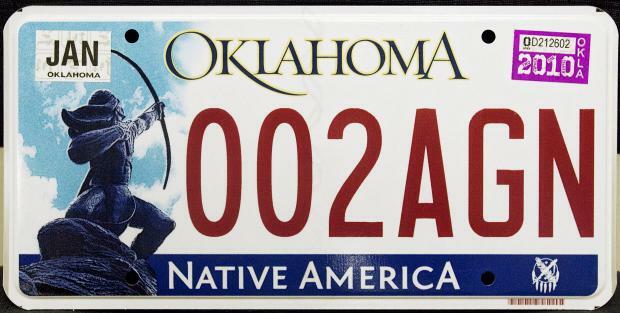 By Sean MurphyState Sen. Clark Jolley sponsored the bill to create a new license plate five years ago to replace Oklahoma’s old tag that featured an Osage Nation shield that is also depicted on the state flag. Jolley also helped lead a panel to narrow the selection down to five finalists and said there wasn’t any thought given to the religious significance of the design. Charles Vargas, a member of the Chiricahua Apache Nation’s governing board, said the tribe’s ancestral lands ranged from what is now Arizona and New Mexico into the high plains of Oklahoma and that many tribe members are honored that the license plate features a Chiricahua Apache warrior. Billy James, a 29-year-old student at the University of Oklahoma, said he has always liked the design of the license plate. “I definitely like keeping the Native American history on the license plate,” said James, who is Catholic. “I think it’s a good reminder of where we came from. I think it’s a good representation of our state. “I find the history of other people’s beliefs in no way offensive to my own beliefs.”Comment: For more on the subject, see Oklahoma License-Plate Lawsuit Reinstated and Oklahoma License-Plate Challenge Dismissed.